There are several key matchups this weekend, none more intense than Clemson at in state rival South Carolina. The National Champs knocked off Clemson last year in Omaha and they also took game one of this series. #9 Stanford has it’s 3rd straight tough road series after winning a series at Rice (2-1) and losing one at Vanderbilt. Their monster schedule continues as they travel to Austin to take on the #6 Long Horns. Texas took game one. In state rival Miami (FL) traveling to Gainesville to take on the nation’s #1 team, Florida where the Gators shut down) the Hurricanes thanks to a gem by two way star Brian Johnson. Gerrit Cole – RHP – UCLA – Jr. 9IP 2H 0ER 2BB 8K. Cole wouldn’t be fun to face in a freezing Nebraska environment. UCLA would go on to win in 11 innings. Mark Appel – RHP – Stanford – So. 7.1IP 8H 4ER 2BB 2K. (L, 0-2). Stanford ace is winless but he’s been fine. And he’s faced Rice, Sonny Gray and Vanderbilt and Taylor Jungmann and Texas in his 3 outings. Andrew Triggs – RHP – USC – Jr. 5.1IP 8H 4ER 3BB 3K. (L, 0-1). Tyler Anderson – LHP – Oregon – Jr. 8IP 6H 0ER 3BB 14K (W, 1-0). Against Andrew Gagnon and Long Beach State. Adam Conley – LHP – Washington St. – Jr. 7IP 9H 1ER 0BB 5K. (W, 3-0). The Pac 10 is loaded with pitching talent and through three starts, Conley has been as good as any of his peers. Kurt Heyer – RHP – Arizona – So. 5IP 7H 1ER 0BB 10K. Glad to see he didn’t pitch too long after mixing in a midweek outing against Rice. Erik Johnson – RHP – California – Jr. 6IP 8H 2ER 2BB 8K. Sonny Gray – RHP – Vanderbilt – Jr. 9IP 3H 1ER 0BB 15K (W, 3-0). Brian Johnson – LHP – Florida – So. 5IP 3H 0ER 1BB 9K. (W, 3-0). The nations best two way player hasn’t given up an earned run in 17 innings and has only given up 6 hits. Daniel Gibson – LHP – Florida – Fr. 0IP 3ER 3BB 0K. Rough outing for the freshman. Ryne Stanek – RHP – Arkansas – Fr. 4.2IP 8H 6ER 2BB 1K. Cory Luckie – LHP – Auburn – Jr. 7IP 6H 0ER 2BB 6K. (W, 1-1). Take that New York Tech! Michael Roth – LHP – South Carolina – Jr. 7IP 7H 0ER 3BB 6K. Errors led to 3 unearned runs. Taylor Rogers – LHP – Kentucky – So. 5.2IP 10H 6H 1BB 3K. Taylor Jungmann – RHP – Texas – Jr. 8.2IP 6H 3ER 0BB 9K. (W, 3-0). In Jungmann’s 3 starts, he’s let the bullpen pitch a combined 1/3 of an inning. This showing was against his strongest opponent, Stanford. John Stilson – RHP – Texas A&M – Jr. 6IP 6H 1ER 2BB 10K. Logan Verrett – RHP – Baylor – Jr. 6.2IP 7H 1ER 2BB 7K. (W, 2-1). Brooks Pinckard – RHP – Baylor – Jr. 1.2IP 1H 0ER 0BB 3K. (S, 2). 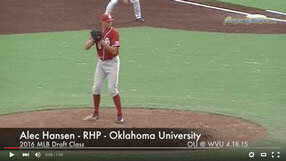 Bobby Shore – RHP – Oklahoma – Sr. 9IP 8H 1ER 2BB 4K. (W, 2-0). Sean Gilmartin – LHP – Florida State – Jr. 8IP 1H 0ER 1BB 11K. (W, 3-0). Mark Pope – RHP – Georgia Tech – Jr. 9IP 4H 0ER 0BB 6K. (W, 3-0). Pope has 0.42 ERA with 19K and 2BB in 21.2 IP. Jed Bradley – LHP – Georgia Tech – Jr. 4.2IP 3H 3ER 4BB 7K. Cory Mazzoni – RHP – NC State – Jr. 7IP 5H 1ER 0BB 13K. Dominant in a game that NC State would end up losing. Patrick Johnson – RHP – UNC – Sr. 7IP 9H 1ER 0BB 6. (W, 2-0). Scott Weismann – RHP – Clemson – Jr. 5IP 6H 4ER 1BB 3K. Randy Fontanez – RHP – South Florida – Sr. 8IP 5H 0ER 0BB 8K (W, 1-1) Unsigned 15th round pick last season (Reds). Brian Dupra – RHP – Notre Dame – Jr. 8IP 10H 2ER 0BB 10K. Kyle McMyne – RHP – Villanova – Jr. 7IP 5H 1ER 3BB 10K. (W, 2-1). Kyle Winkler – RHP – TCU – Jr. 8IP 4H 0ER 0BB 9K. (W, 3-0). Filling in nicely in the Friday role, but just keeping it warm for Matt Purke, who’s being held up for blisters is expected to pitch Sunday. Taylor Cole – RHP – BYU – So. 6.1IP 5H 3ER 3BB 3K. Matthew Reckling – RHP – Rice – Jr. 2.2IP 4H 3ER 2BB 5K. Anthony Meo – RHP – Coastal Carolina – Jr. 5IP 3H 1ER 2BB 8K. Nice rebound after rough outing last weekend. Noe Ramirez – RHP – Cal State Fullerton – Jr. 8IP 1H 1ER 1BB 8K (W, 2-1). Shut down Southern California. Andrew Gagnon – RHP – Long Beach State – Jr. 5IP 5H 1ER 5BB 6K. (L, 1-2). Against Oregon and Tyler Anderson. Andrew Thurman – RHP – UC Irvine – Fr. 2IP 3H 0ER 0BB 1K. Matt Andriese – RHP – UC Riverside – So. 1.1IP 5H 7ER 2BB 1K. Ryan Carpenter – LHP – Gonzaga – Jr. 6.1IP 4H 4ER 4BB 11K. Even when he’s not sharp, his stuff can dominate. Calvin Drummond – RHP – San Diego – So. 5IP 7H 3ER 3BB 3K. Strong performance in loss to #3 Oklahoma. Lenny Linsky – RHP – Hawaii – Jr. 1.2IP 1H 0ER 0BB 2K. (S, 2). Carson Smith – RHP – Texas State – Jr. 7IP 4H 0ER 1BB 10K. Chris Beck – RHP – Georgia Southern – So. 4IP 2H 2ER 4BB 3K. Against St. Johns. Andrew Chaffin – RHP – Kent St. – So. 7IP 1H 0ER 3BB 10K. Fantastic outing against Louisville. Nick Tropeano – RHP – Stony Brook – Jr. 5.2IP 5H 3ER 3BB 3K. (L, 1-1). Not a bad start against North Carolina.